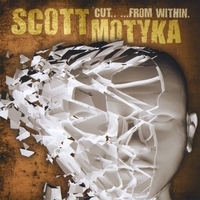 No-frills, melodic shred guitarist Scott Motyka, merges old-school fusion rock with modern-day progressive metal, delivering a fuel-injected, edge of your seat attack, which is equally at home ripping the hardest of rocker’s head’s off as it is melting listeners with introspective finesse. Imagine Robben Ford performing with Tool, covering Paul Gilbert’s ‘Scarified’, using Joe Satriani’s Signature JSX Amplifier. Hailing from the rural suburbs of New England, cutting his teeth on the edgy eclectic music scenes stretching between Boston and Providence, this virtual unknown delivers a passion and energy for his art, sure to please hard rock guitar aficionados, shred-fanatics and fans of raw, rapid-fire riffage. Scott's instrumental dissertation screams of pain, questioning, and angst and conveys the struggle that ensued as he faced his internal demons. From the 'gnashing of teeth' tonality found on “Betrayer’s Trust”, to the solemn intimate resolve heard within tracks like “Rabbiam” and " The Romantical", he projects a depth and dynamic not often found of guitar players within the heavy electric genre. The Sound of Everything You Believe, Becoming a Lie. RadioIndy is pleased to announced that we have published our CD Review of SCOTT MOTYKA music to CD Baby. FANS - Please checkout SCOTT MOTYKA online! FANS - Please checkout SCOTT MOTYKA page and sample / purchase some great new music! RadioIndy is pleased to announced that we have published a music playlist and CD Review with SCOTT MOTYKA music (and similiar Big-Name Artists) to their Rhapsody artist page. FANS - Please checkout SCOTT MOTYKA iTunes page play / purchase some great new music! Radioindy has published SCOTT MOTYKA CD Review to lala Music Online. FANS - Please checkout SCOTT MOTYKA la la and play / purchase some great new music! RadioIndy created a CD Announcement Press Release for SCOTT MOTYKA on Digg.com! "Cut.. â€¦From Within." Reviewed by RadioIndy.com!